Although a photo, once published, is protected by South Jersey Biz's copyright, it is understood that the photographer may use the photo for personal or professional purposes. It is also understood that by sending South Jersey Biz a photo, the photographer is granting the magazine permission to publish the photo. Certain editorial or advertising elements require that the magazine commission a photographer for specific work. South Jersey Biz will compensate hired photographers with a predetermined rate that both the magazine and photographer agree upon in advance of the work. It is understood that while South Jersey Biz receives first rights to publish a commissioned photo, the photographer may then use the photo for personal or professional purposes, though not to be used for or against the photo subject’s business competitors. South Jersey Biz reserves the right to republish a commissioned photo in South Jersey Biz or in material and media related to the magazine, such as the website. Credit will usually accompany any reprinted photo. 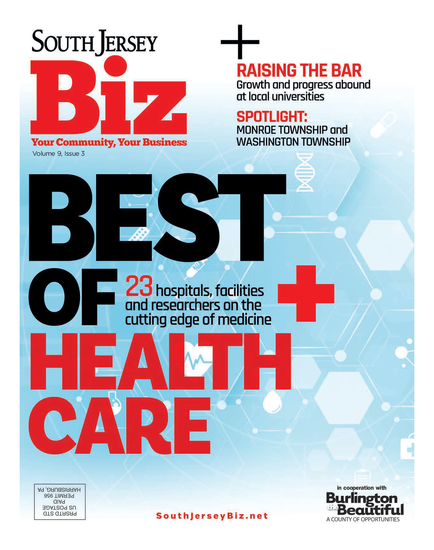 South Jersey Biz’s publisher retains the right to use images of the pages from previous issues of the magazine, which may include a photographer’s image, for any purpose. A photograph commissioned by and published in South Jersey Biz magazine becomes the shared property of the magazine and the photographer. Anyone requesting use of the image for professional use must aquire permission from both the photographer and South Jersey Biz's publisher. Oftentime, photographers will charge a fee for additional usage rights to their photographs, such as use on a business' website or marketing materials outside of South Jersey Biz.